I originally referred to my Writers' Platform-Building Campaigns as "Crusades", but I've recently changed that name for reasons including this one. So we'll be referring to ourselves as Campaigners rather than Crusaders from now on (and I hope you can all get behind the new name as strongly as you did behind the original one). In 2010 we had 55 people take part, many of whom have become great blogging friends. We saw our followers skyrocket and the comments on our posts increase, and had fun taking part in the Challenges as well (kartofflepuffer anyone???). In February 2011, we had 217 people take part before I closed the List, and many more who wanted to join. I made so many wonderful friends, and heard of some awesome connections and friendships being made between other writers. The new Group concept worked very well, and we saw Group interviews, get-to-know-you sessions, a Choose Your Own Adventure bloghop, among other things. The Challenges were again heaps of fun - I think we'll all remember the goldfish bowl flash fiction for a long time! And the Show Not Tell Challenge in April (linked with Arlee Bird's A-Z Challenge) was a ball of fun too! I can't wait to see what fun comes out of this Third Campaign! This Campaign will run from August 22nd to October 31st. I'll be closing the List of Campaigners on August 31st, so join up before then if you want to come on board! During the Campaign, I'll be running Campaigner Challenges and the Campaigner Notice-Board. Other than that, go for your life! I've set up a Campaigner Yahoo Group here, for you to chat among yourselves, and there'll be lots of Twitter-talk at #writecampaign. Each Friday I'll be running a Campaigner Notice-Board, where you can announce blogfests, book launches, things you'd like to share with your other Campaigners, etc etc. You'll need to send me the information in advance, and I've made up a form to make things easier. If you want me to include your details in this Friday's post (August 26), please fill out this form. for designing this - you're awesome! follow the Campaigners in your Campaigner Group(s) (and others if you wish). Due to the size of the Campaign, there's no need to follow all Campaigners!!! 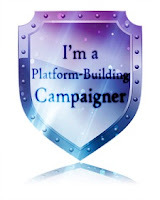 join in my Campaigner Challenges if you wish. They're a great way to get to know the other Campaigners and have fun at the same time. Yep, I'm definitely up for it again!!! Woot! I'm in! YA Authors / Authoresses, tell me who you are and let's get to know each other! Thanks for doing this again, Rach. Last time was brilliant. Wooohoooo!!!!! Sooo excited! Rachael, you rock :) I'm looking forward to meeting everyone! First time on a campaign, super excited! I'm a first-time campaigner too. Excited to get started. Thanks for doing this. I'm already a follower of yours, now working my way through the list of things to do. First time campaigner and excited to get going! I'm in. I blogged about it Friday and again on Monday, Rach. I see some people already commenting that I've been directing this way. I'm going for it again. This time under my other blog, for horror and fantasy. Debs-- I mean Kelda-- pen names are confusing. So stinking excited! I've been waiting for this to come back around! Love the new icon as well. This is totally awesome though I'm scared about missing one of the steps on that list of instructions! Ok, calm down, one at a time. Saying YES here, and THANKS! I'm going to have a go too, to get me through the back to work blib all the way to the first holiday. BTW Elizabeth, your comment made me laugh, it seems we are both instructionphobic! Welcome everyone, so glad to have you on board!!! And a particular welcome to all first-timers, it'll be a blast! I'm so excited!!! Everyone had said great things about the last one. I'm in all the way! Very excited for my second crusade/campaign! I enjoyed meeting fellow writers, some I still blog with often. And I love the challenges. Thanks, Rach for hosting again! First timer...had this on my calendar for months, after I found it while browsing your blog one day. So very excited, and, to be honest, a bit nervous. I hope I can be as an effective supporter of others as they will be of me! I'm a self-pubbed YA writer, btw. I'm happy to join in. Right now, I declined helping. But if my day job winds up giving me free time, I'll let you know. Thanks for organizing this! I am in & very excited!! You know I'm in Rach. Had a blast last time, can't wait to jump in again! Blog post goes up here shortly. This is my second campaign to participate in. Loved the first one, can't wait for this one! Yay, I didn't miss the sign up post! Thanks for doing this Rach! Woohoo, this time I'm in! I'm a first-timer! Looking forward to this! Heard so many things about it... am going to try it out. I'm in! I'm looking forward to it! I'm in this time around. Sounds like a great time. Thanks to Rach for making this happen yet again! I'm back! Looking forward to meeting other bloggers/writers. I just missed out on the last one. I'm very excited to be able to take part this time around! I'm in. Hopefully I'll be able to keep up! I'm just commenting for a hug... well I guess I can do the campaign thing too. Can't wait to do this again! It was so much fun last time! Thanks for organizing this great event!! Sounds fun! I'm a first time campaigner, woo~ Thanks so much for putting this together! Love this! Let the fun begin. Now I get to officially participate. I feel like I have finally gotten into that V.I.P. club. Thanks for hosting Rachel I'm in the process of signing up now! Sounds like a lot of fun. I'm in! Ohh . . I joined in our your previous campaigns and can't wait to get involved in this one! I'm definitely in, my first ever campaign. I can't wait. This looks great. I really liked your Googe Form too. I need to try that. Thanks for the invitation, Rachel. Sounds exciting! I love meeting fellow bloggers and discovering new blogs. I am ready and raring to go! First-time campaigner, happy to be on board. Thanks very much for the opportunity to participate. What a great idea! First-time campaigner, and excited to be part of this! I'm in again. Excited to meet and reconnect with other blogging writers! Thanks Rach! I'm in as a first timer too. I have't missed out on this one? I'm excited--and nervous--but I'm in! Exited to do be a part of this again! So excited. I'm off to fill out the form and get started. I'm new to this and SO EXCITED!! This is just what I've been looking for in the blogosphere, so I can't thank you enough for creating this campaign. I can't wait to participate!! I am excited to participate this time! Newbie here, but looking forward to the campaign! Thanks for doing this again...I'm excited to participate! First-timer here. This sounds like a lot of fun! Hey, I'm back for another round. Still a little bit bummed that it's not the crusade anymore, but oh well. I've been debating this all day, but I think I decided that I'm in. Not that it wasn't fun last time. I'm just a little nervous...not sure why. I'm in. Now I need to figure out exactly what to do. Thanks for the clear instructions. Sounds fun. Saw Deana B's tweet and couldn't resist joining. This will be so fun. Thanks for hosting and I can't wait to get to know everyone! This sounds like just the thing I've been needing/hoping for. I'm in! Thanks for hosting this. Just what I've been looking for. I've been dying to do this since I missed the last one. Count me in!! Oh, I'm definitely aboard. Signing up now! Hi Rachel! this is my first time but I'm all in! Delighted to take part in this! This will be my first campaign, and I'm looking forward to meeting all of you! I've never heard of this before but it sounds awesome... Count me in! Hi Rach! I'm new to all this, but thanks so much for organising it! I'm also in your Aussie/Kiwi group! I'm definitely up for this again. I'm having trouble with the sign up. I'll try again later. I write romance, suspense, travel memoir and short stories and co-host the Romantic Friday Writers, a weekly romance blogfest every Friday. Hey everyone! First-timer here, too. Looking forward to a good run! Good luck everyone. This looks like fun! Count me in! Thank you for hosting this, Rachael. I'm in and looking forward to all the fun! Sounds like a great idea. Sign me up! I missed the chance last time, so I'm excited to go for it this time. Thanks, Rach! Sounds like a ton of fun!!! First-timer. I'm very excited for this! Count me in! I'm a first time Campaigner and really looking forward to this event. Thanks for organizing! I'd love to join! I'm a first-time campaigner and this sounds awesome! I'd in - I just started blogging a few weeks ago, and would love to build some more connections and show my support for others! Loved last year so I'm back for more. This sounds like such a great event! I'm a pretty new blogger and would love to meet others. Count me in! I found about your Campaign through Alberta Ross via A Round of Words in 80 Days. I think it is a splendid idea and I'm chuffed to be able to take part. Howdy! Just filled out the form. Looking forward to it. I'm hoping this'll shake off the cobwebs of my recent blogging efforts. Thanks for doing this. It's a great idea. Yay! Just saw this today, but am super excited! Can't wait to jump in with everyone else!! Happy I found out about this today! Now off to fill the form :)...This will be my first round and I'm very excited about it! I'm in. Looks like a lot of fun! How can a struggling writer not jump on board? I'm here! Thanks for the campaign. What a great idea! Thanks for organizing. I'm so excited about this! It's a wonderful idea, thanks so much for the opportunity to take part! I'm SO in!!! What a fab idea - can't wait to get started! Thanks so much for organizing (again)! Count me in as well. Sounds like fun. What a great idea! I'd love to participate! Okay, a little overwhelmed, I'll admit. But I'm in. I'm giving it a try. Looks like fun! Yay - I just signed up! Hearing lots of buzz about it around the bloggy world, too! I missed the last campaign by just days and I'm excited to be participating in this one. What a great bunch of people! I look forward to campaigning with you. Woot woot! I'm super excited :) I'll blog about it in a couple of days and then I'll finish the form (so I have the URL for my blog post). Thanks Rach! Hugs. I'm in! This sounds so fun! Last time was great. I look forward to participating again! I'm on board for another run. Loved the last time. Change of name? Love it! This will be my first, but I am looking forward to it! This is such a cool idea :) I'm glad I stumbled onto it! Sounds exciting! I know quite a few people who were crusaders, it's nice to get to have a go this time! Wow, this looks awesome! I'm joining up too! I'm so glad I noticed the #writecampaign hashtag on Twitter. Another sci-fi and fantasy writer here. First time campaigning. I'm in. I'll make my post soon. Yay! It's finally here. I'm in and psyched about it. :D Thanks, Rach, for continuing to bring us all together. You're fantastic. I'd definitely like to join. This is my first time participating and I'm so excited! Anyone have any advice for a newbie? This sounds like an interesting way to make connections. I'm in. I would love to join in, but don't feel I have the time. I'll definately be watching out for the tweets and posts tho. Sounds great! I just Tweeted the link to a few groups. Looking forward to connecting with some great people! WOW! I'm an idiot! Totally thought I posted after signing on for the Campaign...but I don't see me here, so I'll do it "write" this time! First time Campaigner, and I really want to thank you for coming up with such a great activity! I'm new to blogging and I'm really excited to see how this goes! So happy you are running this again! Signed up, really happy to move forward! Now I have to go and check what to do next. This looks like a great idea! I'm a published author who could use some support! Thanks to Jen, I noticed it and came to see what it was about. I'd like to try this. I mean, you've got almost 200 comments! Jeeze! I've never see such support in all my blogging life. I'll have to sign up and get back to this soon. Joining! Third round... here we go! I've given up blogging as I don't have a lot of time. Although I do need motivation, companionship, and encouragement. I seem to lack it wherever I go. I'm in! First timer. You all will have to show me the ropes. I'm in. Thanks for doing this! First timer too! hugs! I'll be taking part, this seems like a fantastic idea! I left a comment here yesterday...but I don't see it. Rachel...am I loosing my marbles?? Count me in! I was in the first, missed the second, and am looking forward to the third. Is it too late to sign up? I'm in for this!! I'm trying to find the linky list but i can't find it. Can someone direct me to it, please? I'm in! Does anyone else write historical fiction and very long books? YAY! I am hoping I am not too late. Just finished filling in the form. Will be tweeting and facebooking later. Good luck with it all. Fair play to you Rach!